You may even paint them and make them as display pieces in your dollhouse. Wide : 20 mm. High : 4 mm. Main Color : White. Quantity : 10 piece. I have other collectibles. If your see more ! 5 Dollhouse Miniature Bacon. 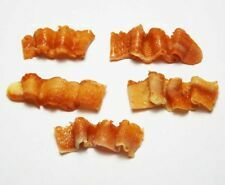 These hand-made dollhouse miniature bacon are of a good quality, and the detail is nice, as you can see from the photo. You will receive 5 bacon. This is unique handmade food, so the item you receive will not be exactly like the one in the photo, but very similar. 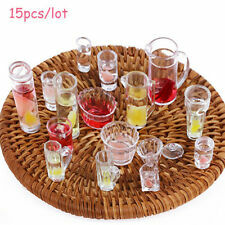 Size (Approx) : Cup 0.7 cm., Tart 1.5 cm. Quantity : 1 Tart, 1 Cup (Wood tray not include). All products are handmade from Thai people and distribute in Thailand. These miniature can decorate your house and for those who love this tiny pieces as well. You may even paint them and make them as display pieces in your dollhouse. WidexLong : 20x20 mm. High : 5 mm. Orange, Pink, Yellow, White as you like. ---- You can selected color e.g. : Cockerel, Blue, Green, Brown . 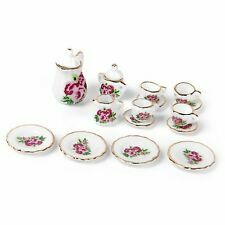 10-Piece Dollhouse Miniature Mixed Ceramic Plates & Cup Set. This dollhouse miniature ceramic plates and cup set is of a good quality. Material of plates & cup : Glazed Ceramic. 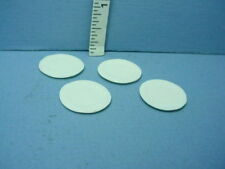 Size of plates & cup: See photo with ruler. 20 mm.x20 mm. You may even paint them and make them as display pieces in your dollhouse. WidexLong : 20x20 mm. High : 5 mm. Orange, Pink, Yellow, White as you like. ---- You can selected color e.g. : Cockerel, Blue, Green, Brown . Product Code : Kitchenware. =>kitchenware, Cookware, Artificial Flower, Food, Cake, Bottle, Display and Accessories. Don't forget to see our new products in ARRIVAL. Coffee Cup Width : 1.00 cm. Orange, Pink, Yellow, White as you like. Stand cake or bakery for your dollhouse. You may also use it for your own handmade miniature dollhouse food. You may even paint them and make them as display pieces in your dollhouse. =>kitchenware, Cookware, Artificial Flower, Food, Cake, Bottle, Display and Accessories. Product 3x Cake Shovel Pizza Pie Server Miniature. Dollhouse Miniatures. 1/6 Scale Dollhouse. Square Cylinder. Display Case Box. Small Size. Keep it dry and cool, avoid sunning. Large Size. You may even paint them and make them as display pieces in your dollhouse. The work is made of ceramic glaze ,beautiful and durable Handcrafted. Suitable to create the dollhouse by your imagination. The work is made of ceramic glaze ,beautiful and durable Handcrafted. Suitable to create the dollhouse by your imagination. Or a collection of miniature collectibles. You may even paint them and make them as display pieces in your dollhouse. Coffee Cup Width : 1.00 cm. Orange, Pink, Yellow, White as you like. =>kitchenware, Cookware, Artificial Flower, Food, Cake, Bottle, Display and Accessories. Don't forget to see our new products in ARRIVAL. Material : Handmade from Clay. Orange, Pink, Yellow, White as you like. ---- You can selected color e.g. : Cockerel, Blue, Green, Brown . Quantity : 10 Piece. (See in the picture). My item arrive to you about 2-4 weeks. =>kitchenware, Cookware, Artificial Flower, Food, Cake, Bottle, Display and Accessories. Don't forget to see our new products in ARRIVAL. Orange, Pink, Yellow, White as you like. ---- You can selected color e.g. : Cockerel, Blue, Green, Brown . You may even paint them and make them as display pieces in your dollhouse. Main Color : White. Quantity : 10 piece. I have other collectibles. If your see more ! (See in the picture). High : 4 mm. Main Colours : White. 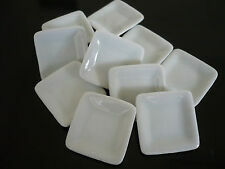 - 4 Scalloped plate. I have other collectibles. If your see more ! Coffee Cup Width : 1.00 cm. My item arrive to you about 2-4 weeks. 3.8cm, height 1.3cm; quadrate plate length 3.9cm, width 2.4cm; jug height 2.5cm; total weight 250g around. Applicable for: 1/12 Miniature Dollhouse. 2~4 10% off at least 1. 40 PIECES CHINA TEA SET. 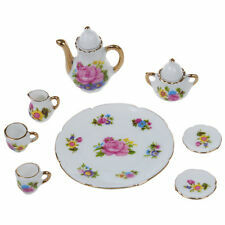 DOLLHOUSE TEA SET 8PCS. Applicable for: 1/12 Miniature Dollhouse. 2~4 10% off at least 1. Including: 1 tea set(which in the first picture). Care Instruction: Keep it dry and cool, avoid sunning. small pot height 1.8cm(9/12"). You will find lots of interesting Dollhouse miniatures & other collectibles. Pictures are enlarged to focus details. Material : Ceramic. We will try our best to help you. Color: As the pictures. The high-quality and unique designed concept of 1/12 dollhouse. Material: Ceramic. All products are handmade from Thai people and distribute in Thailand. These miniature can decorate your house and for those who love this tiny pieces as well. Quantity : 1 Set (1 Bread, 1 Cup, 1 Paper Bag). Exquisite collection for dolls Applicable for: 1/12 Miniature Dollhouse. Do not miss it! The porcelain tea set is a new type of miniature tea tools. The design is in line with the trend of reality Ceramic Tea Set. 1 Piece Pink Ceramic Cake Stand Display Dollhouse Miniatures. Cake Stand Prefect for showing cake and bakery or deco. Cake Stand. cake stand made from clay. =>kitchenware, Cookware, Artificial Flower, Food, Cake, Bottle, Display and Accessories. Product use: 1:12 or 1:6 scene matching. 2 This product is only a toy accessory and does not apply to real people. USD 1.86 26 sold. CAD 1.86 22 sold. USD 6.63 19 sold. USD 2.09 17 sold. USD 4.32 21 sold. Plastic Cake Stand Prefect for showing cake and bakery or deco. Cake stand made from plastic. =>kitchenware, Cookware, Artificial Flower, Food, Cake, Bottle, Display and Accessories. Don't forget to see our new products in ARRIVAL. 1 X milk jug. colour: Blue&White. Note: Light shooting and different displays may cause the color of the item in the picture a little different from the real thing. 2 X cover (with box). 4 X small dish. 1 x milk jug. Note: Light shooting and different displays may cause the color of the item in the picture a little different from the real thing. 4 x little dish. Material: Pottery. What You See Is What You Get! 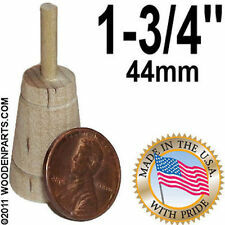 Mini whip for your dollhouse kitchen. The miniature scale for this miniature whip is 1", which is equal to 1:12. Or simply use this miniature whisk in your open kitchen cabinet drawer. of mini whip in scale 1", 1:12. Kitchenware & Tableware. Dollhouse Miniatures. 1/6 Scale Dollhouse. Bath Appliance. Square Cylinder. Display Case Box. Small Size. Large Size. The dollhouse scale of this miniature dish mould is 1:12 scale. This dollhouse baking dish has a pleasant appearance and looks very pretty. 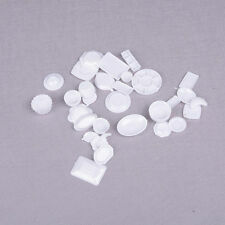 The miniature dish mould can be used as a dollhouse cookware to complete your dollhouse kitchen accessories. 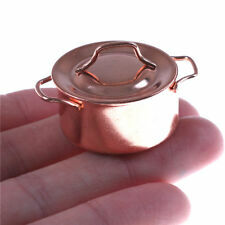 One miniature frying pan or miniature wok as part of your dollhouse kitchen supplies & collections. This miniature dollhouse cookware is a single piece item and is fully made in the dollhouse scale 1:12. You may even paint them and make them as display pieces in your dollhouse. Wide : 25 mm. High : 3 mm. ---- You can selected color e.g. : Cockerel, Blue, Green, Brown . Orange, Pink, Yellow, White as you like. Product Code : Kitchenware. A set of 20 coffee set for your dollhouse. You may also use it for your own handmade miniature dollhouse food. You may even paint them and make them as display pieces in your dollhouse. 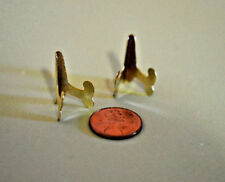 3 Dollhouse Miniature Cake Stand Set. This hand-made dollhouse ceramic cake stands / plates set is of a good quality, and the detail is nice, as you can see from the photo. 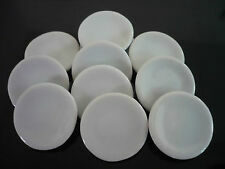 You will receive 3 ceramic cake stands / plates.